I don't write a lot of review posts, as those don't seem to get a whole lot of traffic. I recently made a couple YouTube videos about the Otterbox Defender case for iPhone. I've been using one for a couple years on an iPhone 3GS. The case has held up really well, much better than my previous case. I've dropped it on the sidewalk a couple times and even in the snow, but the case has protected it from any harm. I like the dual layered protection that you get with the Otterbox case. It is a hard plastic case, which includes a screen protector. Then you put a rubber case on top of the plastic. This provides some extra impact protection and makes it easier to grip. The only things I don't like about the case are the size of it (it's really bulky). I also don't like that it seems like the screen always develops a "watermark" look. There isn't much to do about the size of the case. You could use the included belt clip to hold it, or you could carry it in a cargo pocket like I often do. As for the watermark, I've found a couple short term solutions, but nothing permanent. My wife and I are always looking for new hiking trails to try. With little kids it can sometimes be difficult to find trails that can accommodate the whole family. Obviously trails with low vertical altitude gains are easier for little legs. 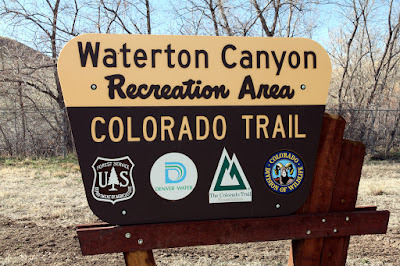 We decided to try a hike at Waterton Canyon, knowing that it follows the river, which means there isn't a lot of altitude gain. Waterton Canyon is a 6.5 mile trail that ultimately ends at Strontia Springs Reservoir. The reservoir is a water supply for the city of Denver. The "trail" to the dam is actually a gravel road that allows construction access. The city of Denver has been rebuilding the Strontia Springs Dam, and is aiming to complete the project by the spring of 2012. While there is a lot of parking at the Waterton Canyon trail head, it can still fill up pretty quick during the weekends. If you want to get a parking spot, try to arrive early, or if your schedule allows, go for a hike during the week when there are fewer people around. 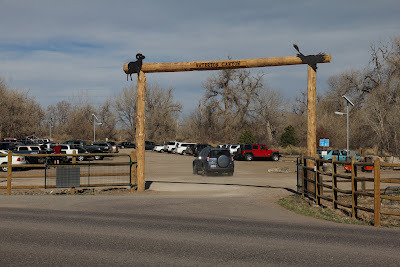 As with any trailhead, make sure that you lock up your vehicle and take valuables with you. If you can't take them with you, at least hide them in the vehicle so that they aren't visible from outside. It would be a shame to have a wonderful hike ruined by someone breaking into your car! One great thing about the Waterton Canyon hike is the wildlife. 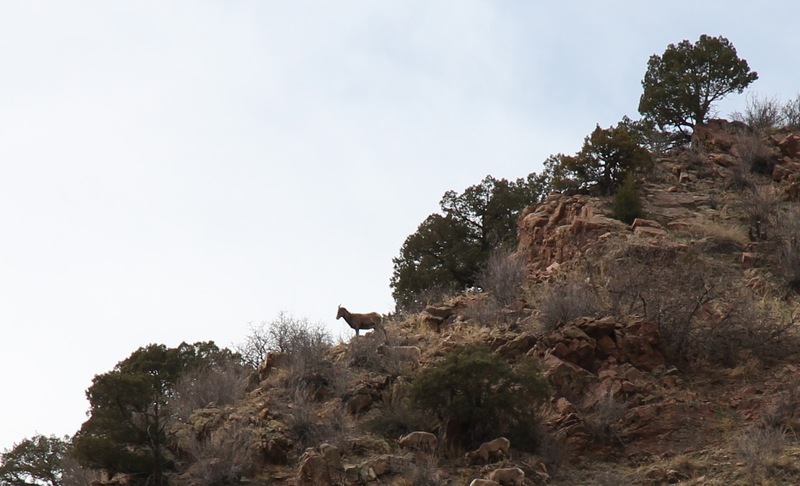 As you start up the trail you will see signs that let you know that there can be Bighorn Sheep near the trail. When we went, we weren't disappointed. Within a mile of the trailhead we saw a herd of over 20 Bighorn Sheep! When it comes to the Denver Metro area, I cannot think of any other open space or park where you can see Bighorn Sheep so low in the foothills. I'm used to driving to the area between Dumont and Georgetown on I-70 before I see any Bighorn Sheep. We only ended up going up the trail about two miles, so there was still a lot left to explorer. While I'm calling it a trail, it is really more of a gravel road, as mentioned above. That means that whether you are hiking or biking, there is plenty of room on the trail to get past other people. You shouldn't have to worry about the cyclists getting too close to you or your family as they go by. We also decided to look for some geocaches while we were out and about. We ended up not looking for any of the caches near the parking lot, but we did look for one near a rest area along the trail. It was a fairly large one and was supposed to have a travel bug in it, but unfortunately the bug wasn't there. There was plenty of room to exchange swag though. If you decide to find this cache, make sure you bring something to trade. 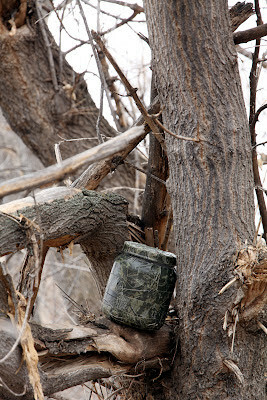 A large geocache, plenty of room for swag! 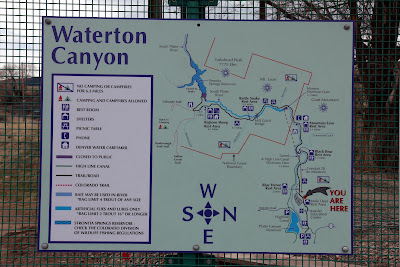 Check out the map below to see where Waterton Canyon is located. I would highly recommend it for anyone that is looking for an easy trail to hike/bike or if you want a chance to see Bighorn Sheep without driving deep into the mountains. Or you could use Waterton as an easy hike to start preparing your legs and endurance for your more difficult hikes this summer! Are there any local trails that you would like to see some more info or pictures of? Let me know in the comment section below and I will try to add them as well. It's been almost a year since I started this blog. Some of you may remember that it started out as Adventure Colorado Blog. As the blog has grown I decided to move to the name Rocky Mountain Adventure to show that I'm interested in sports and activities from a larger area. I know that I haven't been writing as much lately, but it's hard to write as much about activities that most people enjoy during the summer, when it's cold and snowy out. I thought that I would post some of the most popular posts here. Make sure you check out some of these posts if you haven't already. Trolling With Lead Core Line- What is it? For the last couple years, Colorado anglers have faced a controversial struggle between maintaining the populations of Lake Trout and Kokanee Salmon in Colorado Reservoirs. Blue Mesa Reservoir, one of the nation's largest Kokanee Salmon fisheries, is also known as one of Colorado's Lake Trout hot spots. While many people go to Blue Mesa looking for trophy Lakers, the majority of the Blue Mesa anglers are after Salmon. In the last few years, Blue Mesa's Salmon populations have dropped from over one million fish, down to a current estimate of about 280,000 fish. The growing Lake Trout population is believed to be one of the largest causes of the drop in numbers. In the last two years, the Colorado Parks and Wildlife (CPW) has removed the limits on smaller Lake Trout and started harvest programs designed to reduce the numbers of Lakers in the reservoir. "Colorado Parks and Wildlife collected 11 million eggs from kokanee salmon running out of Blue Mesa Reservoir this fall, a record harvest which ensures that it and 26 other reservoirs which rely on stocking will receive an ample supply of salmon fry next spring. This fall's record eclipsed the previous mark of 9.2 million eggs harvested in 1993 and more than doubled the 5.4 million eggs taken in 2010"
While the CPW warns that the extra harvest does not necessarily indicate that the Salmon population has recovered, it is encouraging to see that more Salmon will be raised and stocked than ever before. 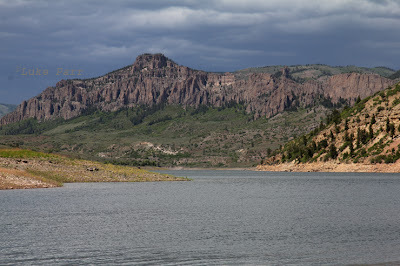 When I fished Blue Mesa last year, I was told by several of the guides and marina employees that they had seen a better catch in 2011, then they had seen in the last few years. While the eggs from this year's harvest will not be big enough to catch in 2012, they will hopefully start to improve the fishery over the next few years. Here is a link to the CPW Press Release. Fall Spawning Runs from Colorado Parks & Wildlife on Vimeo. Which species of fish do you prefer to catch, Lake Trout or Salmon? Let me know in the comment section below.